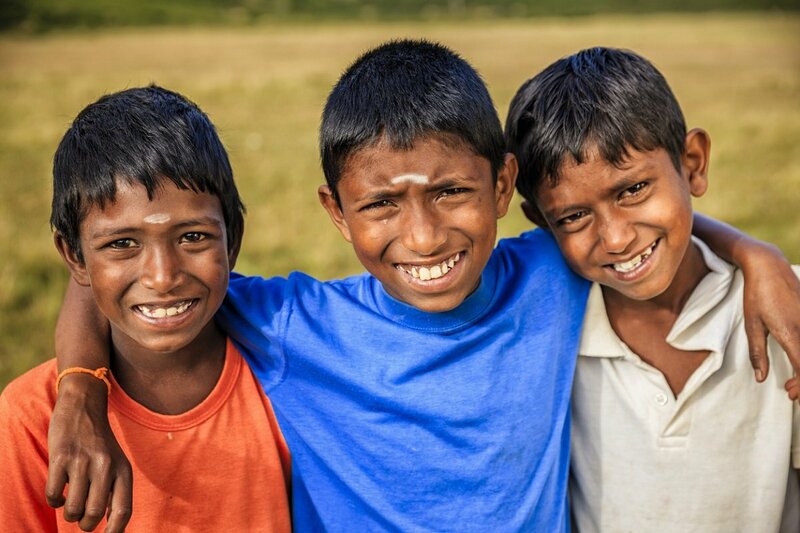 Sri Lanka with Children – Book Exciting Family Holiday to Sri Lanka! 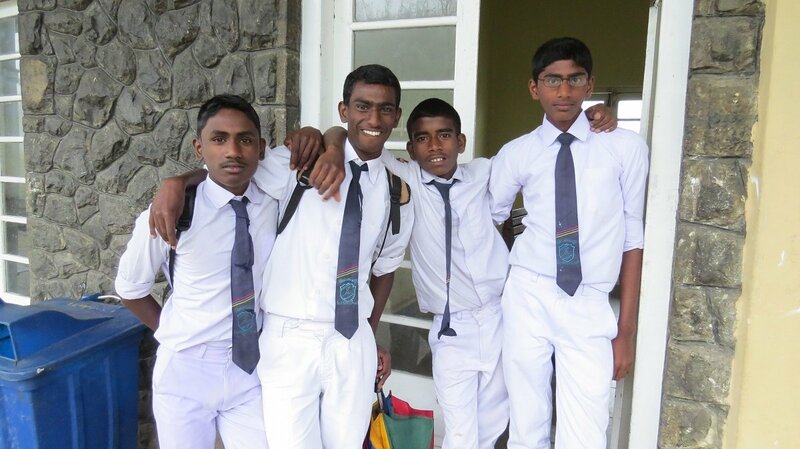 Sri Lanka is a fantastic country to travel to with children. The distances are manageable, the experiences are very child friendly, and the locals will welcome you with open arms. We’ve selected family friendly hotels and all the hotels have a swimming pool. An array of exciting experiences are included on the itinerary, but not too many, so you also have plenty of time to relax along the way. 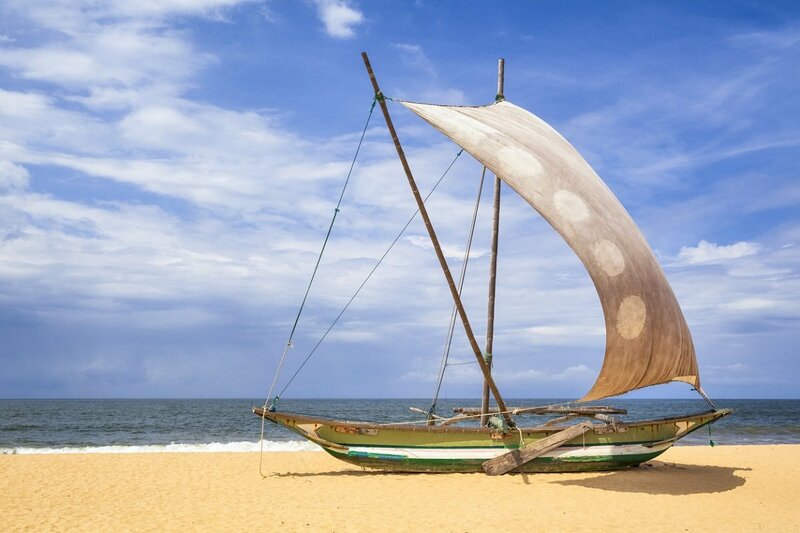 After the flight, you get off to a gentle start in the beach town of Negombo. From here, you head to Kandy, stopping at the elephant orphanage in Pinnawala, where you can experience playful elephants bathing in the river. 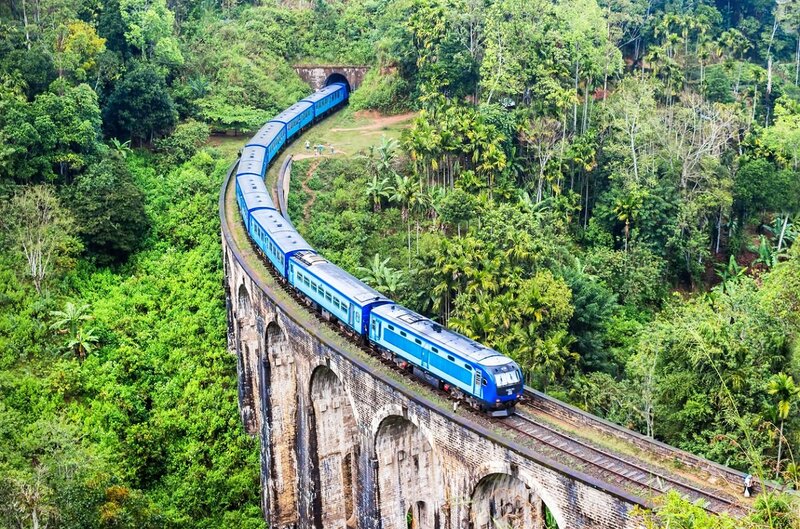 From Kandy, you embark on a scenic journey through Sri Lanka’s highlands with lush green mountains, tea plantations and waterfalls to the delightful town of Ella. Ella is idyllically situated at the end of a large canyon, and on a clear day you can see all the way to the coast. 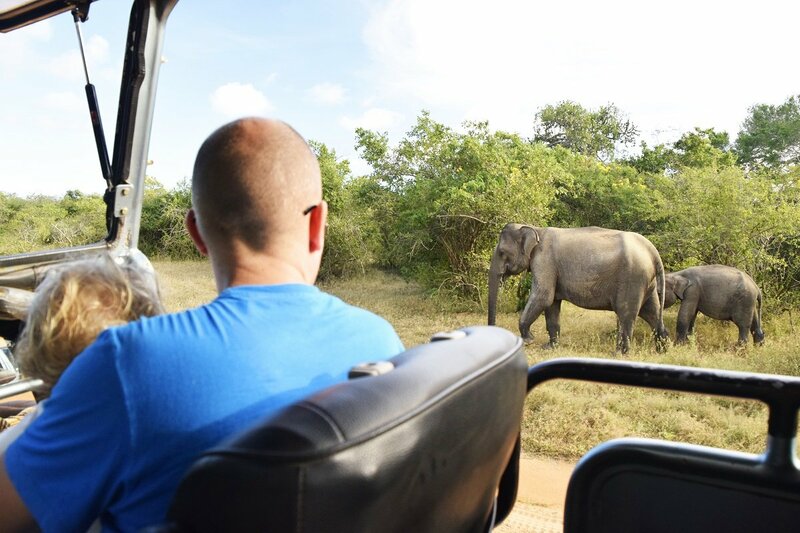 From Ella, you drive via the sacred pilgrimage site Kataragama to the Yala National Park, where an amazing wildlife experience awaits you on a jeep safari, when you can spot monkeys, elephants, crocodiles and, with a little luck, a leopard. 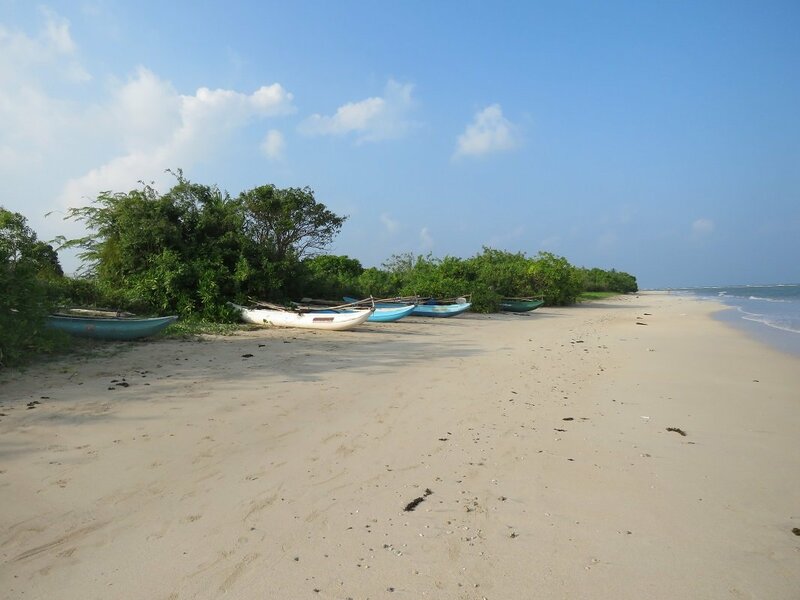 You have the option of extending this tour with a beach holiday at one of Sri Lanka’s beautiful beaches. 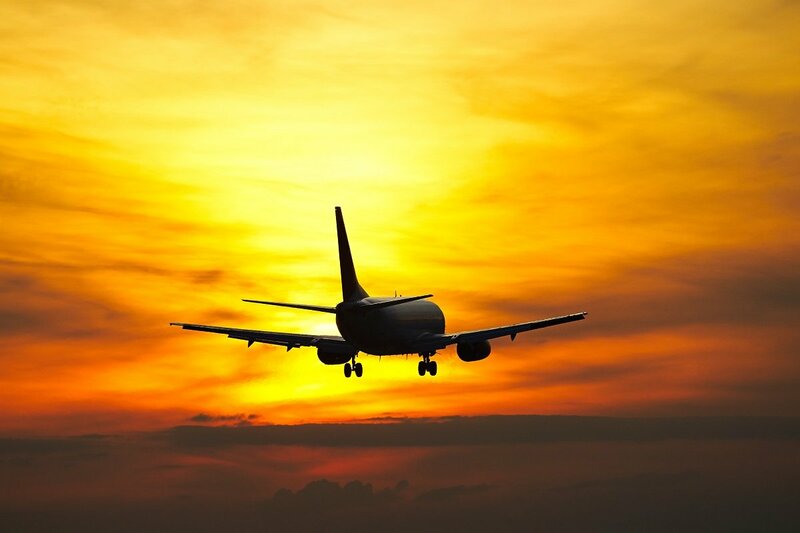 Departure day, where you will fly to Colombowith connecting flights along the way. You arrive at the airport in Colombo and pick up your luggage. Your guide is waiting for you in the arrivals hall, holding up an Asia Tours sign. He will drive you the short trip to your beach hotel in Negombo, where you can relax after the long flight and acclimatise to the time difference and the new temperatures. 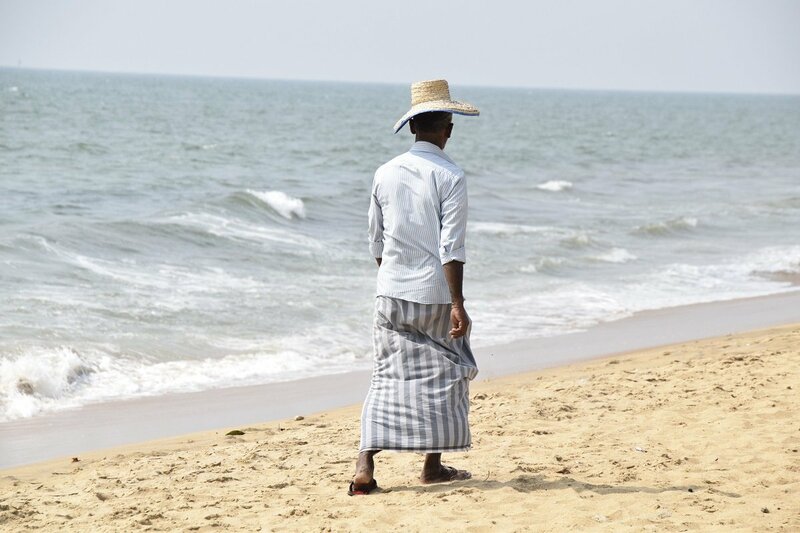 Negombo is known for its wide, golden sandy beach, and you have the day at your leisure to swim, play or relax with a good book by the hotel’s swimming pool. 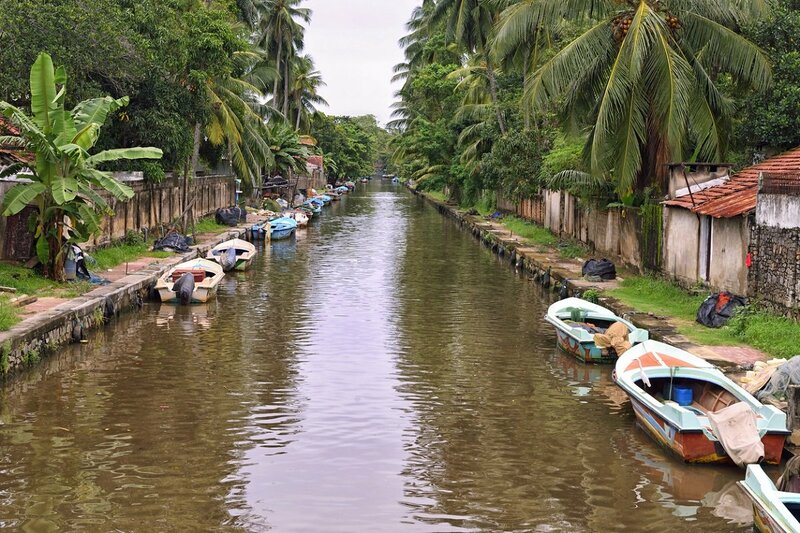 You can also go on a tour and discover the Dutch channels, a legacy of the colonial era, when the Dutch built more than 100 km of canals to transport goods. Enjoy a beautiful sunset from the beach. 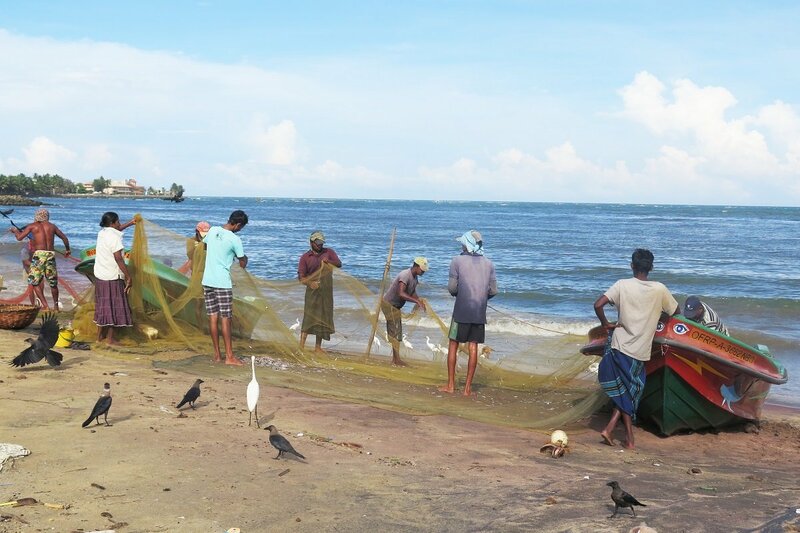 Negombo offers a good mix of tourism and local life. 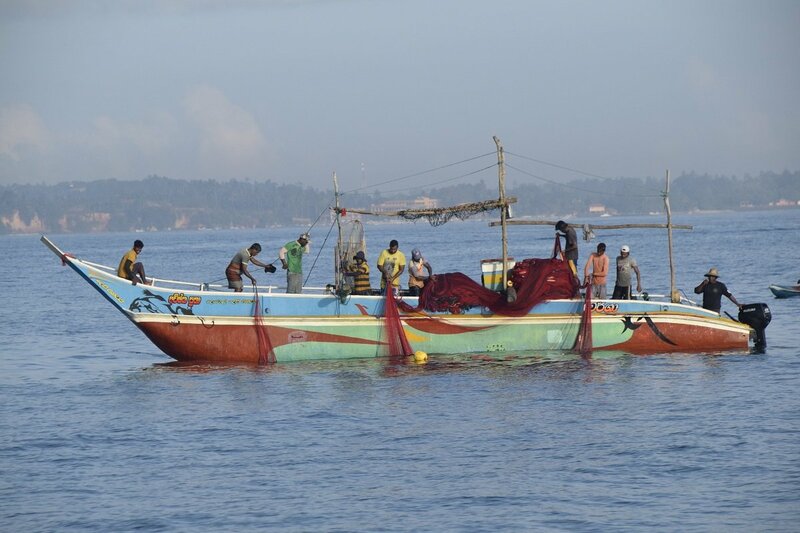 Many of the locals still make their living from fishing, and early in morning, the fishermen come ashore and get their catch ready to sell at the small Lellama fish market. Be sure not to miss out on this experience. You will be picked up early at the hotel by your driver/guide, who will take you down to the exciting fish market, where you can walk around and look at the night’s exciting catch and experience the authentic atmosphere. 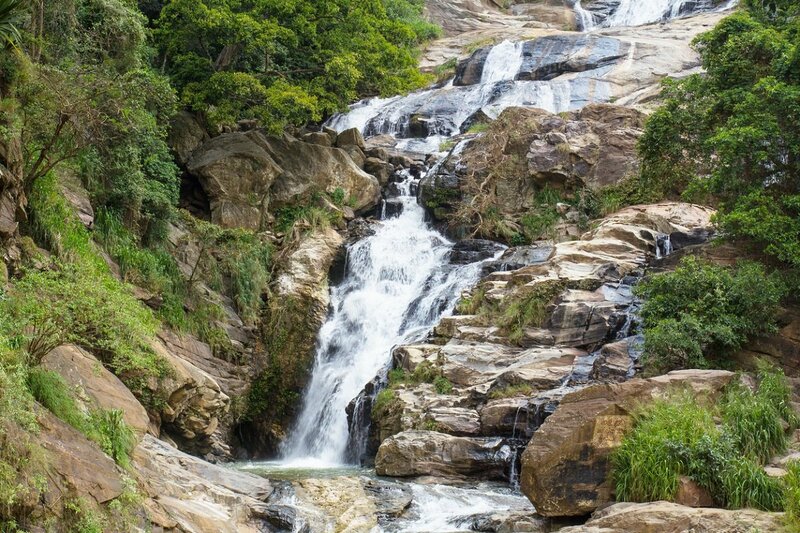 After this experience, you are driven back to the hotel, where you can eat breakfast and check out before your driver/guide takes you to Kandy. On the way to Kandy, you will pass the elephant orphanage in Pinnawala. It’s a wonderful experience to see all the elephants that live here. The elephant orphanage takes care of orphaned and injured elephants. When it opened in 1975, there were just seven elephants – a number that has grown to more than 80 today! The Sri Lankan elephant is on the list of endangered species due to the reduction of its habitat, and the herd has halved over the past 75 years. 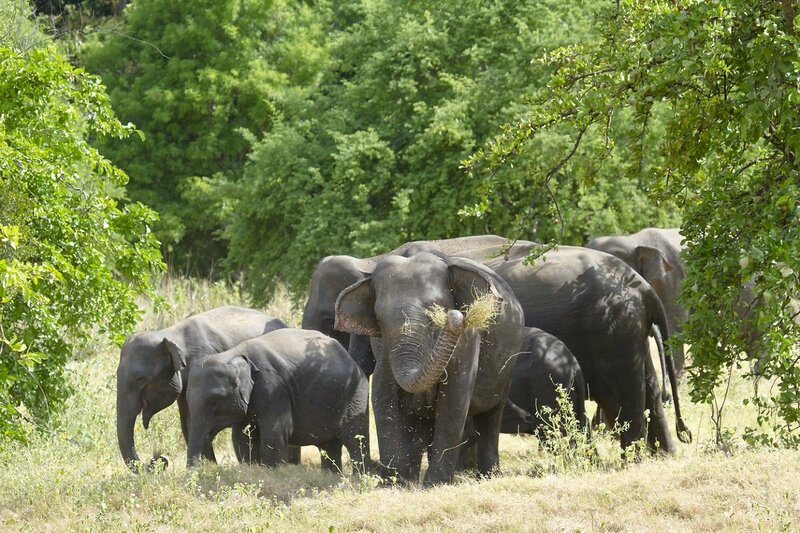 In Pinnawala, they have succeeded in creating a breeding program for elephants. You get right up close to the fascinating giants, and you might also see the cute, playful baby elephants. A couple of times a day, the many elephants walk through the high street down to the river to bathe. It is a wonderful sight to behold, the elephants splashing about merrily in the water. You can enjoy your lunch at one of the riverside restaurants, watching the bathing elephants. After visiting the elephants, you drive on to Kandy. 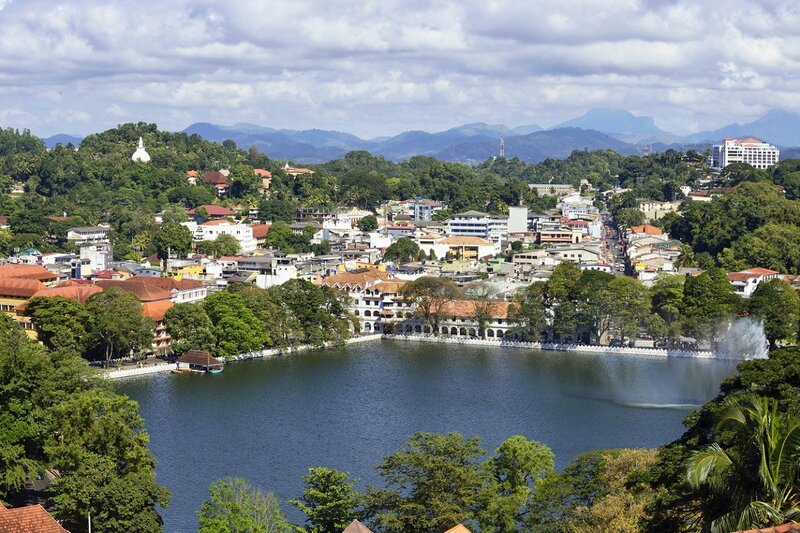 Kandy enjoys a scenic location at an altitude of around 500 metres, between the green mountains and down to the artificial lake of the same name. It is known as the city that clung to its freedom long after the rest of the island came under colonial rule, and has managed to preserve its unique traditions and culture, which live on to this day through music, dance and architecture. You have the morning to yourself before your driver/guide picks you up from the hotel and drives you to your accommodation in Ella. 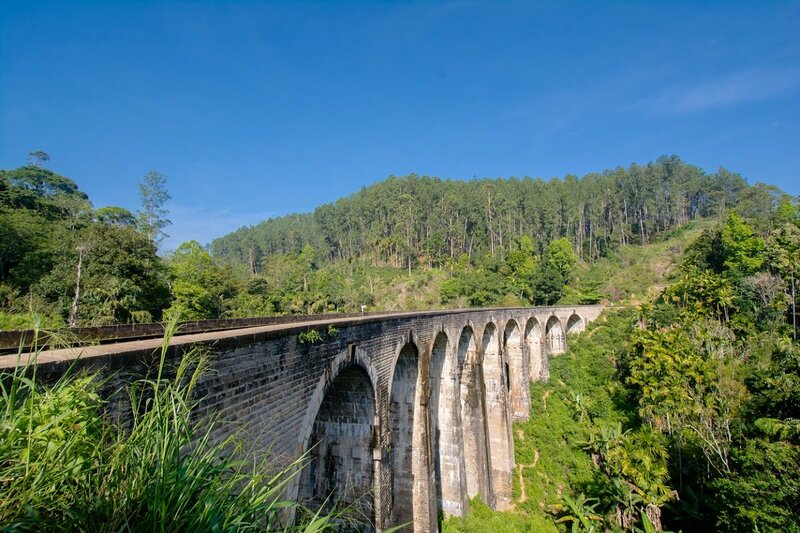 You can choose to replace part of the drive with a scenic train ride from Nanu Oya to Ella. See more below. 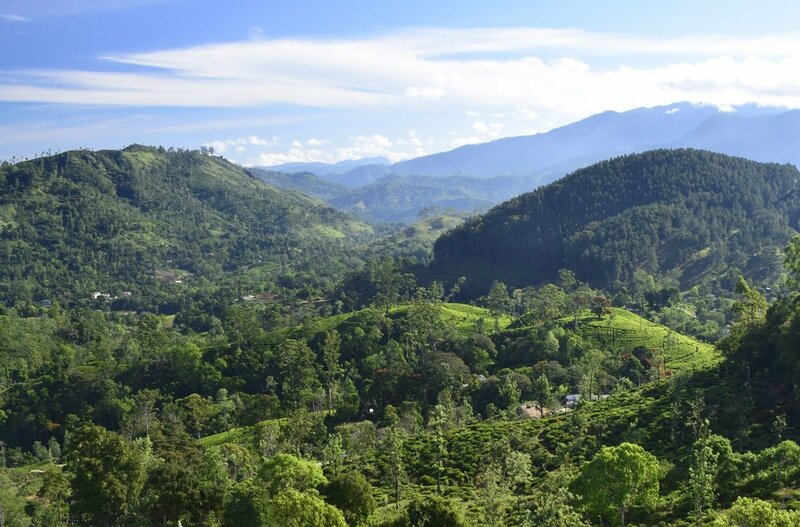 The drive to Ella is incredibly scenic, taking you through Sri Lanka’s enchanting, lush highlands, past small waterfalls, green tea plantations and vibrant local life in the small villages en route. If you want to get out of the car to take pictures, simply ask the driver/guide to pull in to the side. You arrive at your accommodation in Ella in the evening. Ella is beautifully situated in the mountains at the end of a canyon, Ella’s Gap, and on a clear day you can see all the way to the coast. 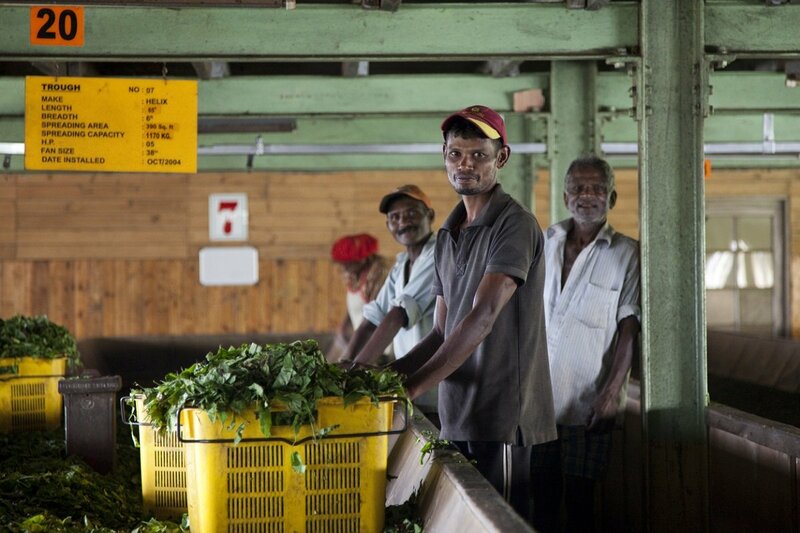 Ella is surrounded by tea plantations, and in the afternoon, your driver/guide picks you up and drives you to a tea factory, where you will experience the whole process from when the leaves are picked to when the tea is packed and ready to be exported overseas. 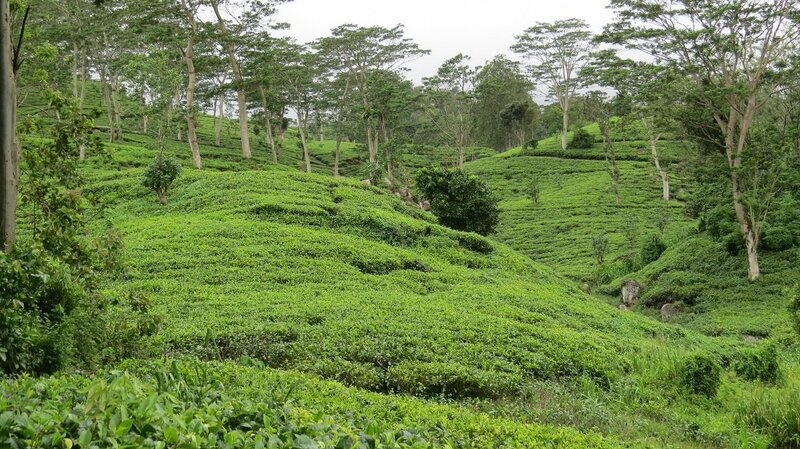 Sri Lanka is world famous for its tea production. In the evening, you can go for a stroll in Ella and have dinner at one of the cosy little cafés or restaurants. There is a lovely, relaxed atmosphere in this scenic mountain village. Today, a short trek to Mini Adam’s Peak awaits you. It’s a walk of a few hours that may well give you a little sweat on your brow! 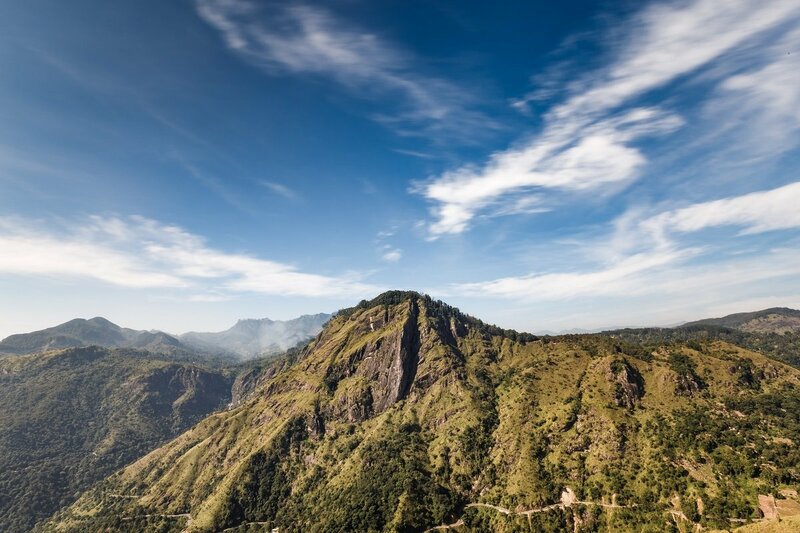 Mini Adam’s Peak is a perfect hike for families, and is not to be confused with its big brother, the “real” Adam’s Peak, which is a tough hike, located in a completely different part of the country. From the top of Mini Adam’s Peak, you get a fantastic view down through Ella’s Gap. In the afternoon, your driver/guide takes you down to the Nine Arches Bridge, a beautiful, iconic bridge that Ella is known for. 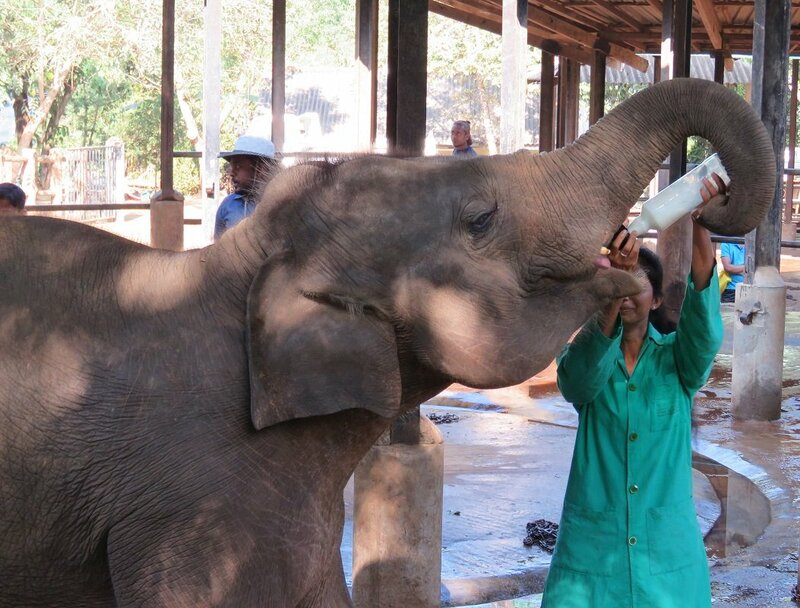 The time has come to say goodbye to Ella, and you drive along winding mountain roads to Yala. 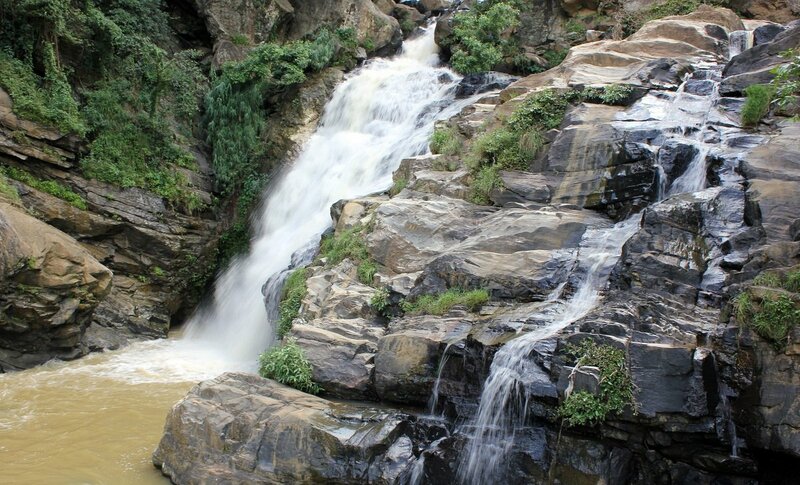 On the way, you stop at the beautiful waterfall, Ravana Falls, and the town of Kataragama, which is one of the holiest pilgrimage sites in Sri Lanka. Every year, thousands of Hindus, Buddhists and Muslims make the pilgrimage to pay their respects, meditate and pray to their gods. 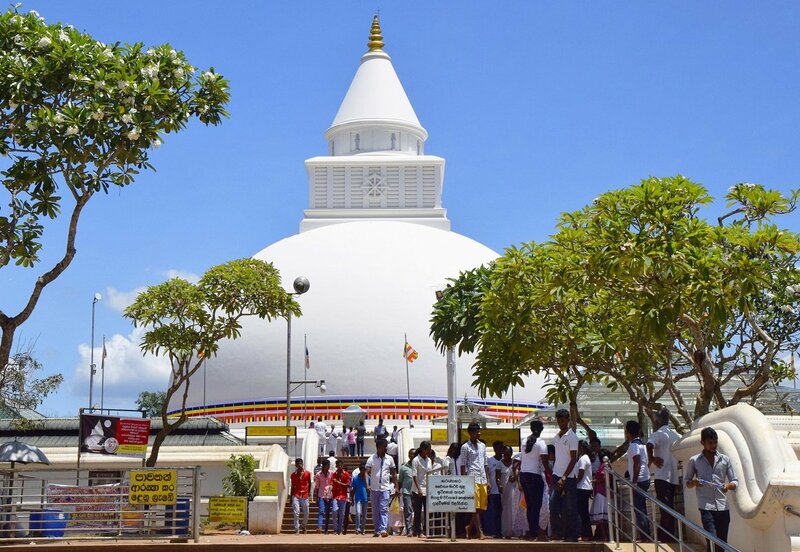 Buddha is said to have meditated at the Kiri Vehera stupa in Kataragama on his third and final visit to Sri Lanka. You arrive at your hotel in Yala in the late afternoon. You enjoy a quiet morning, relaxing at the hotel. In the afternoon, a fantastic safari experience awaits you in the Yala National Park. The Yala National Park is Sri Lanka’s oldest national park, and its second largest at 978.8 km2. The park is home to more than 215 different species of bird and 44 different species of mammal. You may be lucky enough to see elephants, deer, crocodiles, wild boars, buffalo, monkeys and leopards here. 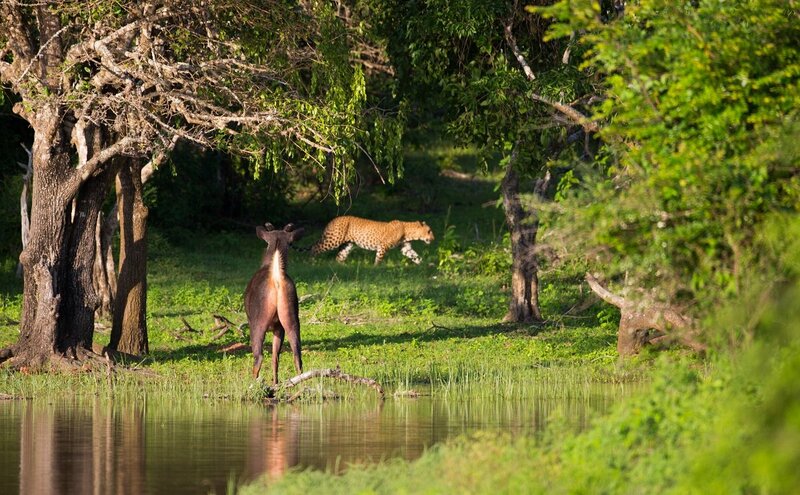 Yala is said to be one of the best places in Sri Lanka to see leopards. However, they often hide in the bushes and are hard to spot. You have a skilled guide with you to help spot the animals and talk about the park’s impressive flora and fauna. Please note: Yala National Park will occasionally close some sections, or the entire park in the period between September – October. 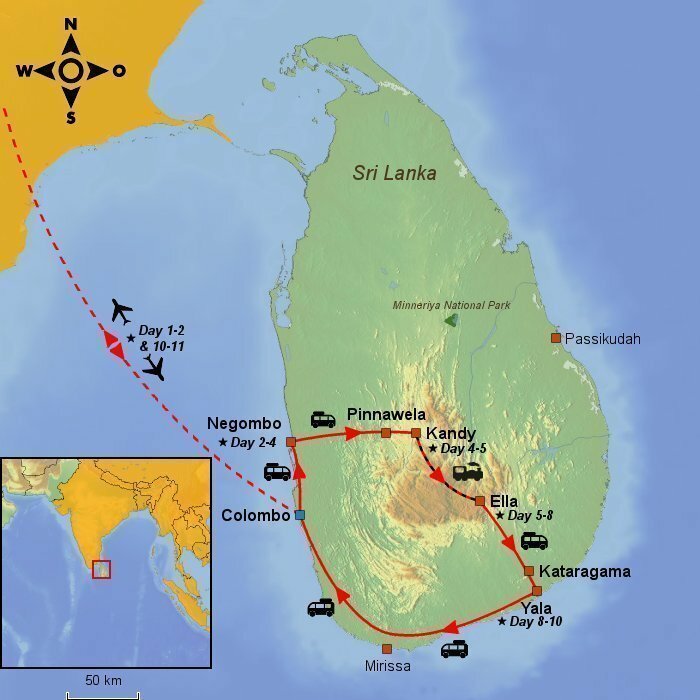 If you are visiting Sri Lanka in this period, please be aware that your safari in Yala may be replaced with a safari in Udawalawe National Park instead. From Yala, the trip heads to the airport in Colombo. 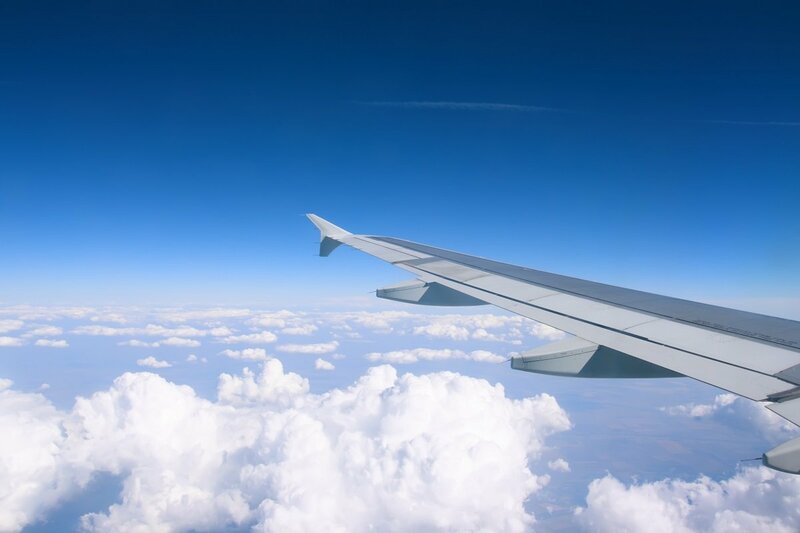 From here, you fly to the UK, with connecting flights along the way. 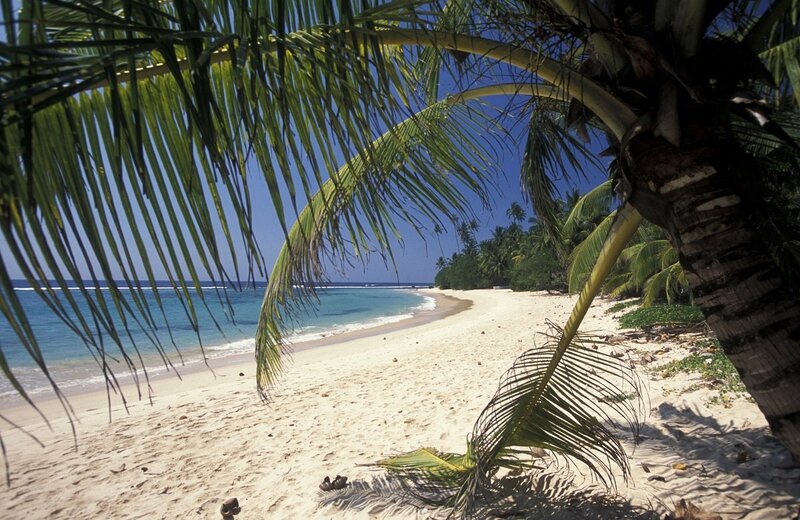 You have the option of extending this tour with a beach holiday at one of Sri Lanka’s beautiful beaches. See more below. You land in the UK after an eventful tour. The stay is with half board. We warmly recommend extending your holiday in Sri Lanka with a beach holiday. The period from December to March is the best time to visit Sri Lanka’s south and west, and here on the south coast of Sri Lanka is the small resort town of Mirissa. Mirissa has really earned its place on the world map after no fewer than 26 different species of whales have been discovered swimming close to the town in the season from October to April, including the biggest whale of them all: the blue whale. But there is more to Mirissa than whales alone. The cosy little resort has a superb sandy beach, surrounded by swaying palm trees, and it’s hard not to fall a little bit in love with the place – the perfect place to round off your Sri Lankan adventure. We warmly recommend extending your holiday in Sri Lanka with a beach holiday. 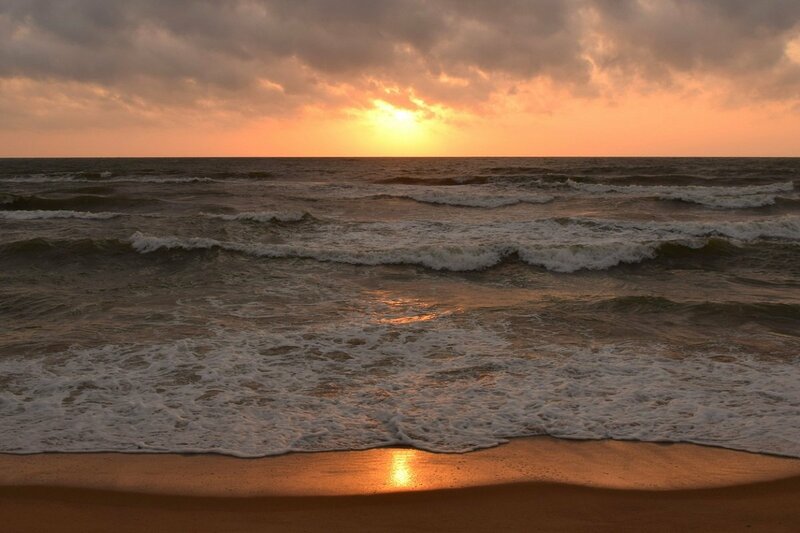 The period from December to March is the best time to visit the south and west coast of Sri Lanka, and the resort town of Negombo lies on the west coast, just 30 minutes or so from Sri Lanka’s international airport. 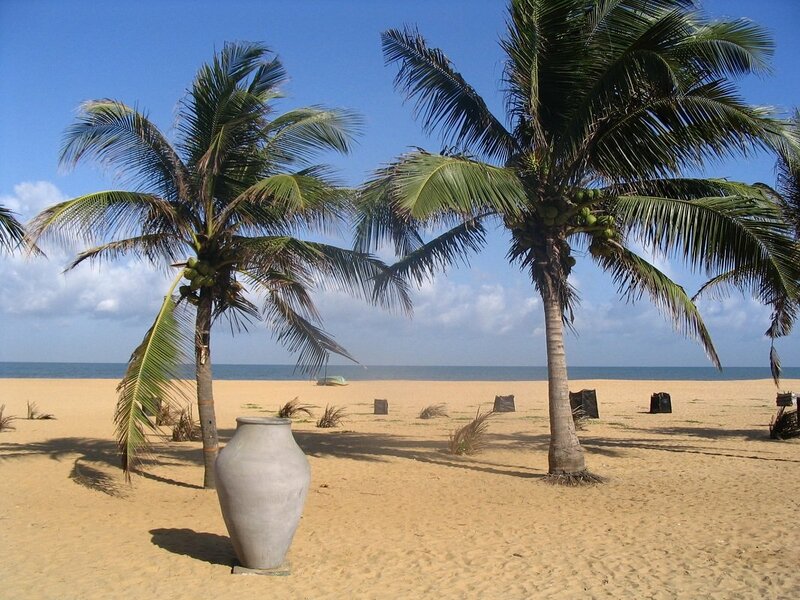 Negombo is known for its wide, golden sandy beach and its pleasant holiday atmosphere. 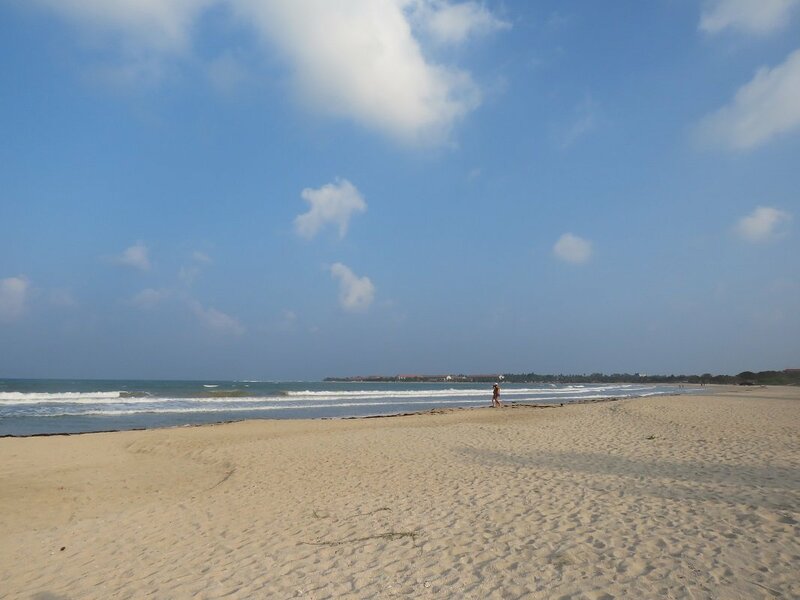 It is a versatile holiday town, where you have every opportunity to relax and enjoy your last few days in Sri Lanka with a good book by the pool or on the beautiful sandy beach. Negombo has a wide selection of hotels, restaurants and shops, and there is a good mix of tourists and locals. 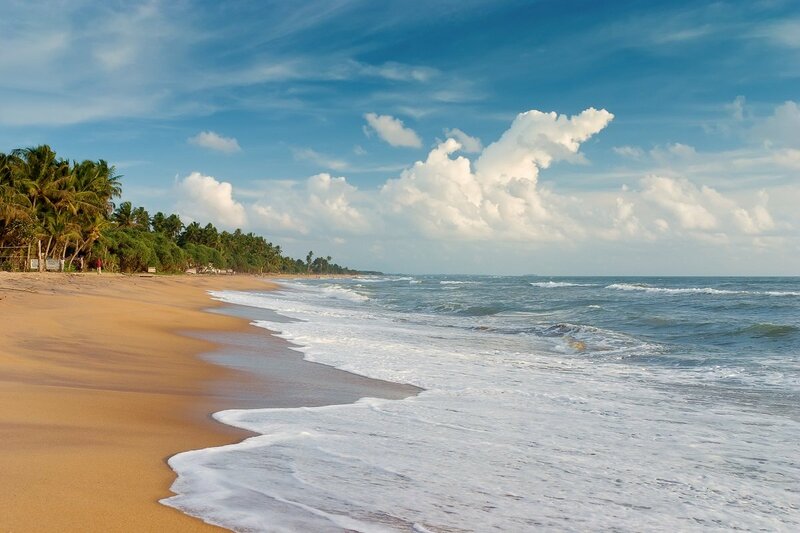 We warmly recommend rounding off your holiday in Sri Lanka with a beach holiday extension. 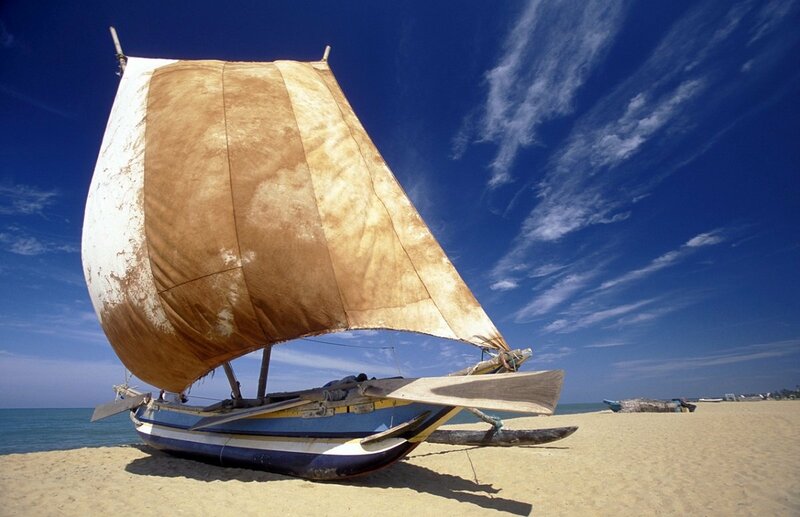 The period from May to September is the best time to visit Passikudah, located on the east coast of Sri Lanka. The small coastal town has one of the world’s longest, bathing-friendly beaches. You can walk more than 1 km out into the sea without getting out of your depth. The bay at Passikudah is protected by a reef, which makes it one of the island’s safest places to bathe. It is also a great place to snorkel and see the wonderful colourful fish and beautiful corals. 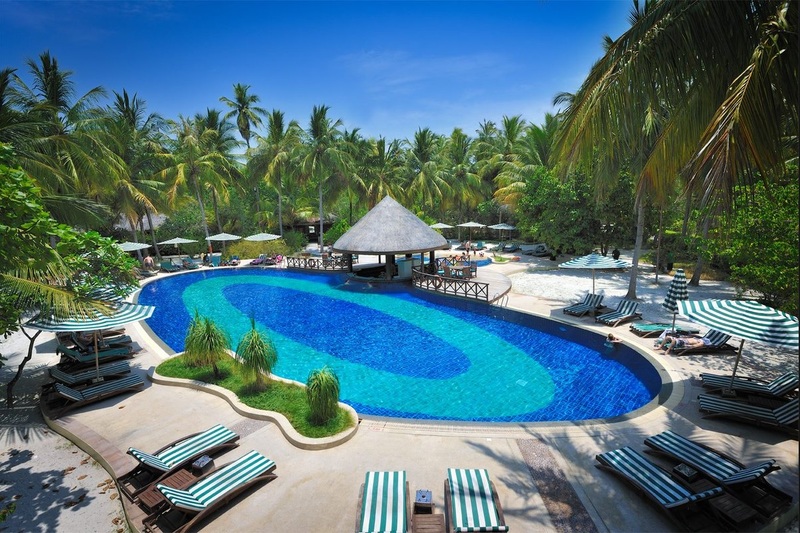 Passikudah is famous for its picturesque beauty, with palm trees, soft golden sand and crystal clear waters. 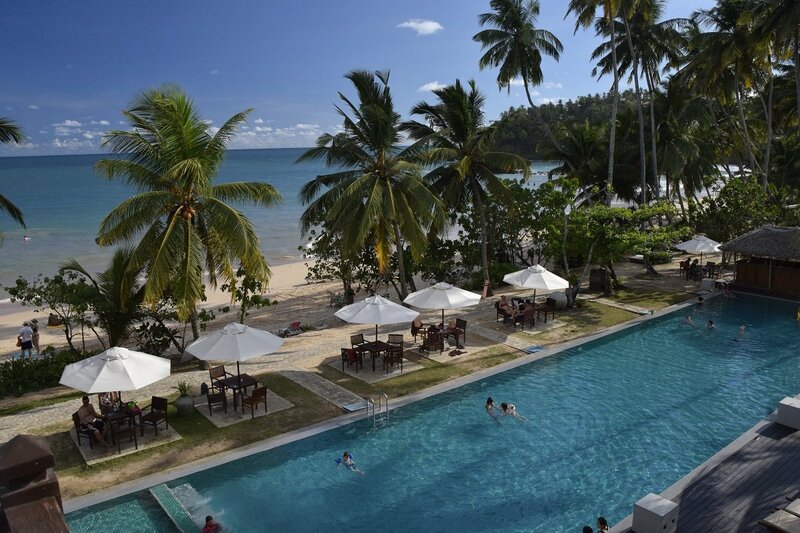 Enjoy the last days of your holiday here in paradisiacal surroundings. Note that on this extension for Passikudah, you will spend 3 nights in Passikudah and 1 night in Negombo. The stay is with full-board and based on a deluxe room, sleeping up to 2 adults and 2 children. The Maldives are located in the Indian Ocean, south-west of Sri Lanka, stretching 820 km from north to south and 120 km from east to west. Asia’s smallest country, it is made up of 1,190 small coral islands, divided into a ring of 26 smaller archipelagos called atolls. The islands are surrounded by deep blue sea and turquoise lagoons, protected by unspoiled coral reefs. The Maldives are the lowest-lying country in the world, with an AMSL of 1.5 metres. Only 202 of the islands are inhabited, while 87 of them are designated for tourism. In 2017, the islands set a record for the number of tourists, and it’s not hard to understand why, as the Maldives are pure paradise. 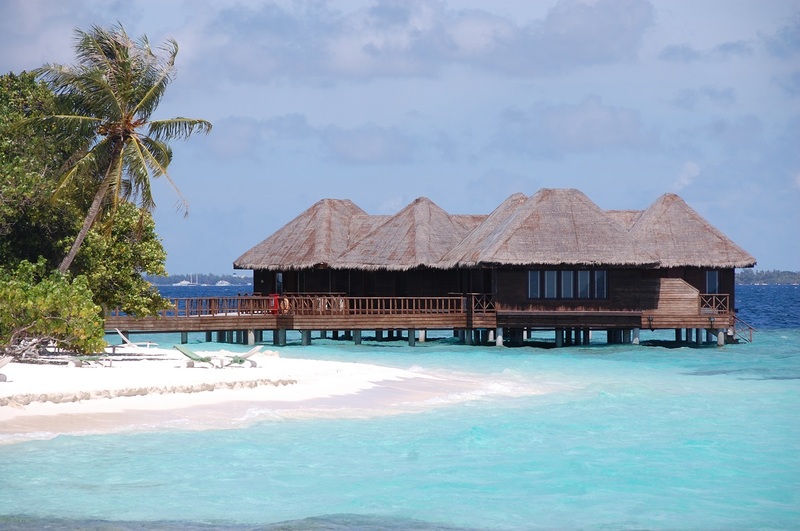 There are lovely bungalows on the beaches, villas built on poles in the turquoise water, an average temperature of 30 degrees all year round, ten hours of sunshine a day, white sandy beaches where coconut palms sway in the light breeze, and crystal-clear waters. The colours of the Maldives are so vivid and intense that you won’t need different filters on your photos – they’ll look like a top-quality postcard whatever! 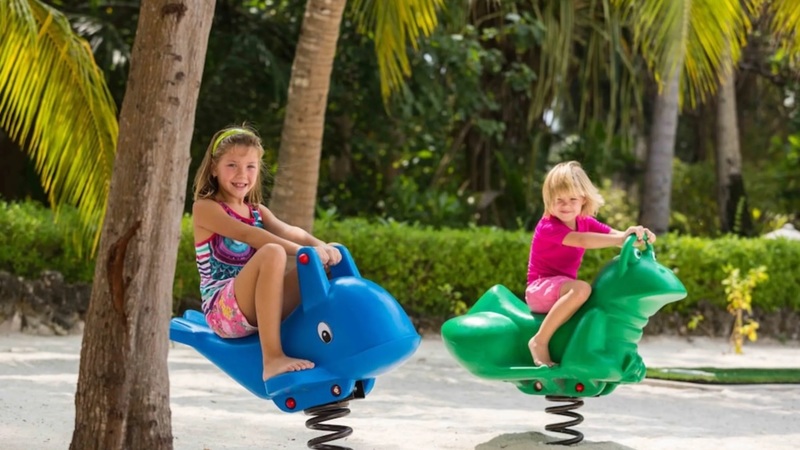 Bandos Island Resort offers a children’s club and a variety of fun activities for the young and old alike. Exciting excursions are also offered, including a sunset cruise where you can see dolphins as well as snorkelling and diving trips. The Maldives are paradise for divers and snorkellers, offering some of the world’s most beautiful reefs brimming with corals and fish in all the colours of the rainbow – and who knows? You might even find Nemo! In the evening, you can go for a walk along the beach and enjoy the beautiful sunset or drop into the Clubhouse and play games and table tennis. Why not make your dream come true? Come with us to the Maldives where you will find the world’s most beautiful bounty beaches and activities for all the family. 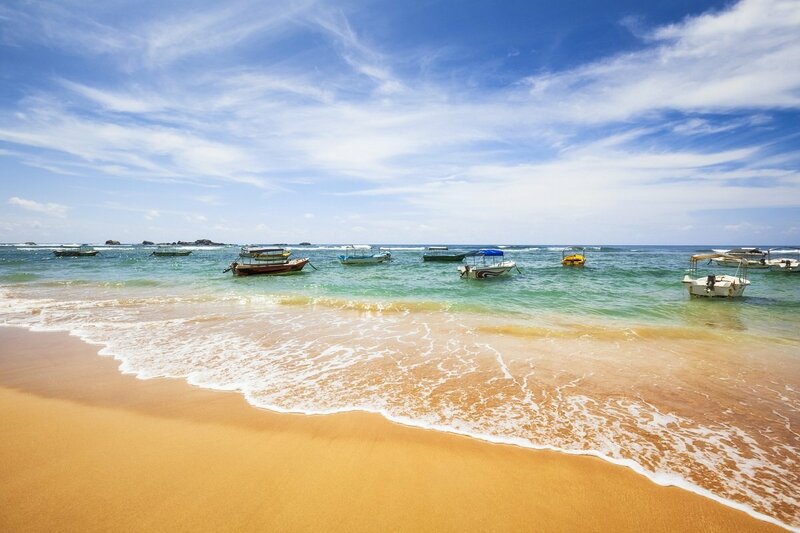 We highly recommend extending your holiday in Sri Lanka with a beach holiday. The period from December to March is the best time to visit south-western Sri Lanka, where you will find the holiday resort, Hikkaduwa. Hikkaduwa first found itself on the map of the world back in the 1970s and is one of Sri Lanka’s first holiday resorts. In Hikkaduwa, you’ll find plenty of hotels, restaurants, souvenir shops and tour operators, who organise trips both above and below the water. 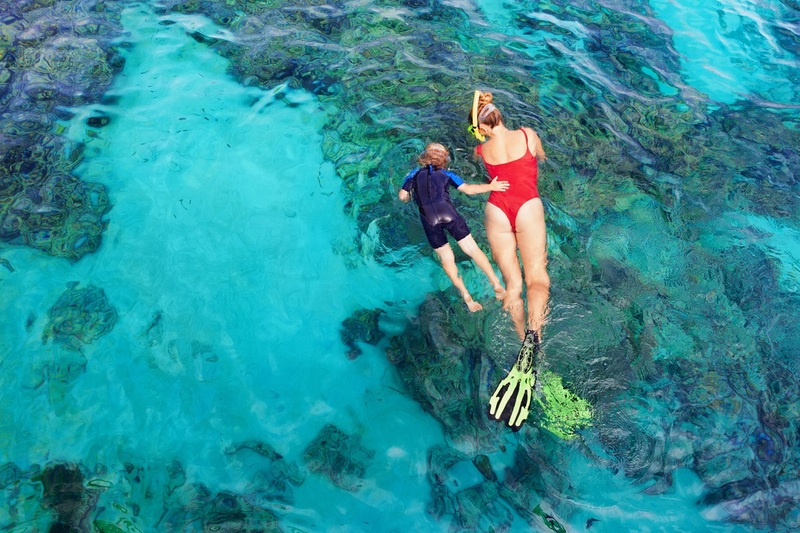 Off the coast of Hikkaduwa is a large coral reef where you can snorkel and dive with lots of beautiful fish and turtles. 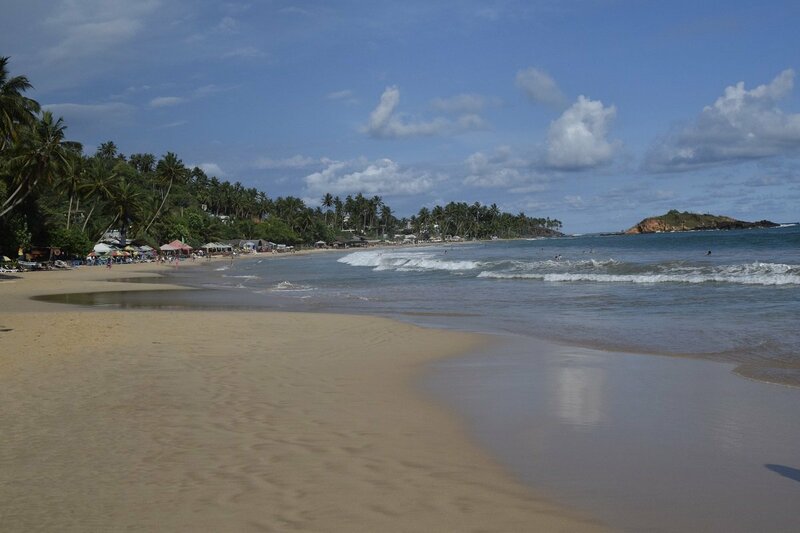 Hikkaduwa is a popular holiday destination, and rightly so, as, despite its increasing popularity, the town has managed to retain its cosy, relaxed atmosphere. The price is based on families of 3-4. If there are more/fewer of you travelling together, please contact us for a price.